Did you actually read all the works you cited in your high school and college papers? If not, you’re probably not the only one. Because a non-existent paper seems to have been cited over four hundred times by supposedly reputable research. 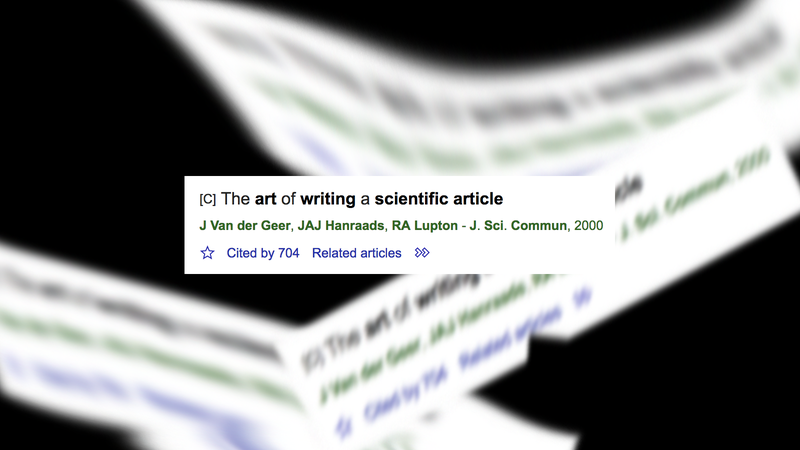 Van der Geer, J., Hanraads, J.A.J., Lupton, R.A., 2010. The art of writing a scientific article. J Sci. Commun. 163 (2) 51-59. Most of the papers that cited the phantom reference were “fairly low-quality conference papers,” Harzing told Retraction Watch. But still, the four hundred all appeared on the reputable Web of Science that indexes scientific articles. The reference pops up over seven hundred times on a Google Scholar Search. Given the “publish-or-perish” attitude of science, there’s lots of places where lower quality work slips through, as well as journals preying on scientists who’ll pay to publish or don’t know any better. The presence of even more junk on the less-filtered Google Scholar results demonstrates that, well, there’s a lot of crap out there. But in this case, since no one is outwardly committing fraud, Oransky hopes that this silly story will help continue the conversation about improving scientific publishing.